A double review? What on earth is a double review? Well, it’s just what is sounds like: today we’ll be looking at two figures at once! And these figures are two who are so similar(you could even say inseparable) that I felt it would be a crime to not showcase them together. I present you: figma Kurisu Makise Lab Coat ver. and Okabe Rintarou by Max Factory! Okabe and Kurisu come to us from the visual novel-turned anime Steins;Gate. Not being a VN player, I was introduced to Steins;Gate by the anime, and enjoyed it quite a bit. Steins;Gate was the first anime I watched weekly(something I still try to do but often fall behind on) which greatly contributed to the suspense in the second half of the series. The story has to do with time travel and features and intricate and tightly woven plot with outcomes reliant on what are sometimes miniscule events in the past. If Steins;Gate teaches you anything, it’s that you shouldn’t mess with the past unless you’re prepared to fix it. The very nature of the story makes it an excellent candidate for re-watching, but what draws audiences to Steins;Gate is not just the plot, but the characters. The show’s cast is made of remarkably colorful characters who manage to always feel genuine. At the heart of the story are the interactions between Mad Scientist Okabe Rintarou and actual scientist Kurisu Makise. Okabe is a slightly nutty gentleman who operates his own lab/hang out spot in a rented room above a TV shop. One of his most identifiable traits is his mad scientist persona which is complete with a lab coat, faulty experiments, a maniacal laugh, and even fake phone calls to a nonexistent organization. On the contrary, Kurisu is a the daughter of a notable scientist and has had her own research published. By the choice of Steins;Gate, the two meet and are united by their affinity for lab coats and Dr. Pepper among other things. Of course the their interactions are not without bumps as Okabe is prone to teasing and Kurisu possesses tsundere tendencies. These are just a few things which help to make Steins;Gate so grand. A figma of Kurisu in her casual garb was released at the time the anime aired, but it was not until the movie that we were treated to a figma of Kurisu in her lab coat along with the long awaited and greatly demanded Okabe. Being a fan, I immediately added these two to my collection. Gears are a recurring motif in Steins;Gate, so both boxes are appropriately covered in them. 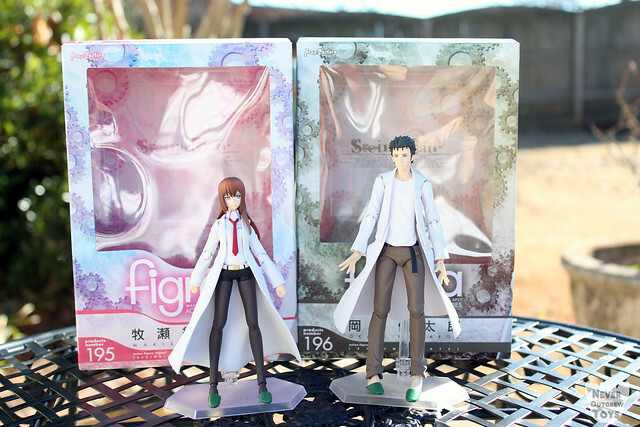 Okabe’s is light brown while Kurisu’s has a pink and blue combination. It is important to note that although released after Miku 2.0, Okabe and Kurisu number before 200 which means they still use the pegged hands and classic box design. Want more Japanese collectible goodness? Then follow the blog!